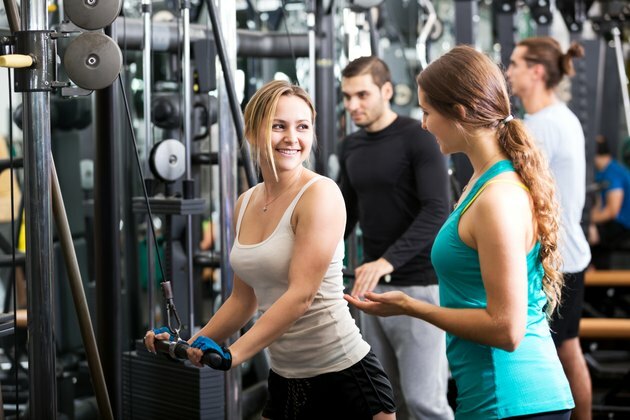 Fitness facility and gym set up can be very complicated if certain rules and guidelines are not followed. There needs to be proper spacing, adequate traffic flow and consideration for those with disabilities. An improper public gym set up can lead to injury or even death, resulting in litigation that can ruin a business. There are general guidelines for persons with disability, but these can vary from state to state, so be sure you know what your specific state requires. According to the National Strength and Conditioning Association, the tallest machines in the gym should be placed on the perimeter of the building along the walls. These machines include squat racks, power racks, Smith machines and assisted pull-ups. This is not only visually pleasing for patrons, but reduces risk of the machine falling and hitting someone. All tall machines should be bolted to the floor for extra stability. Dumbbell racks are traditionally placed along a wall, or in front of a mirror if available. All barbells need to be positioned so that there is at least 36 inches of space between the ends of the barbells. This allows for traffic flow and spotters if needed. Weight trees and racks should have 36 inches of clearance and be placed near plate loaded equipment, such as bench press, squat racks, and Hammer Strength equipment. Olympic platforms need to have three to four feet of clearance on all sides to account for dropped weights and room for spotters. Circuit training machines or machines that use an adjustable weight stack need at least 24 inches of clearance with an optimal clearance of 36 inches. All equipment needs to be placed at least six inches away from mirrors. Mirrors should be placed at least 20 inches above the floor. Pathways need to be at least 36 inches wide along the perimeter of designated exercise areas. If the facility is large and has many areas in which to travel, such as gymnasiums or cardio rooms, circulation hallways need to be at least 60 inches wide to account for high volume traffic and transportation of gym equipment. The International Health, Racquet and Sportsclub Association recommends that a fitness facility allow at least 12 square feet per member. Water fountains should be accessible and placed near all entrances and exits. The general guidelines for the American Disabilities Association state that if there is a change in elevation over half an inch, then a 12-inch ramp must be placed to accommodate persons in wheelchairs. Doors and pathways have to be a minimum of 36 inches wide. Light switches, emergency equipment such as fire extinguishers and AED's must be accessible to someone in a wheelchair. Signs have to be big and bright enough to be viewed by those who have visual impairments. Athletic Business: The “Issue” is Facility Design. “Essentials of Strength Training and Conditioning”; National Strength and Conditioning Association. Baechel, Thomas R. and Earle, Roger W. 2008.